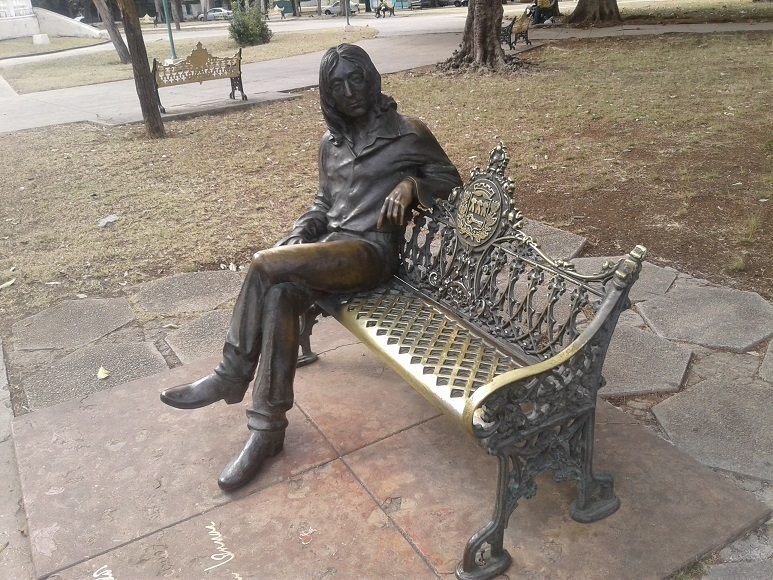 Cuban nationals and foreigners go to the park on 17th and 8th streets to see a beautiful statue of John Lennon which was inaugurated by Fidel Castro. When bathing in this public stunt, putting the man from Liverpool in the Revolution’s book of saints, I guess Fidel left out mentioning that his government had banned the Beatles when they were the most popular band in the world. There’s no doubt that dedicating a statue to John Lennon is the government’s symbolic recognition of their failure in the fight for unanimity and the artificial construction of a population that share the same ideology. Coincidentally, there is another statue in this same park, the statue of Freemason Fernando Suarez Nunez. Now alone and forgotten, he was once the object of Masonic pilgrimages until any public march was banned if it wasn’t a pro-government march. Today, very few people approach this solitary statue of the dignified Freemason, and less people know that he was the creator of a para-masonic sect which was wiped out at the beginning of the Revolution as part of the government’s ambition to interfere in people’s minds, which is so typical of any dictatorship. They not only censored the Beatles to do this (God knows why! ), but they also tried to corner any organization which had its own message. Religious, fraternal, professional, union, management organizations all fell against the Revolution’s offense with the implicit or explicit approval of the masses who they promised paradise to. In post-1959 Cuba, there was only space for one message and one God.